And that is the end of our live coverage for today. Our coverage starts again at 11:30 BST on Sunday for the race as Lewis Hamilton aims to extend his title lead over Sebastian Vettel even further. Thanks for all your comments and until next time, bye for now. Both Lewis Hamilton and Sebastian Vettel have now been on pole four times at Singapore in their careers, while Vettel has one more victory with four compared to three from the Englishman. Can Hamilton match that and make it a fourth Singapore victory tomorrow? You've seen the qualifying result and now predict the winner of this race. Mercedes driver Lewis Hamilton produced one of the best laps of his career to take a surprise pole position for the Singapore Grand Prix. Hamilton's first lap in final qualifying, described by his race engineer as "epic", was enough despite failing to improve on his second run. "That lap felt like magic," the world champion said. "I don't know where it came from. I am overwhelmed." 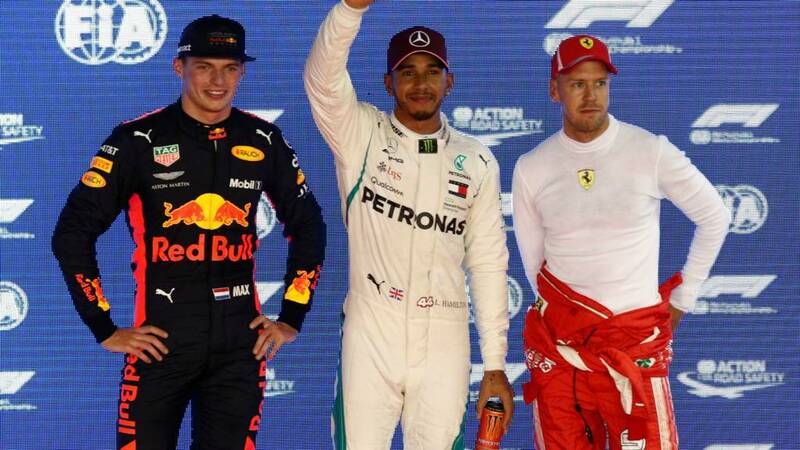 His title rival Sebastian Vettel was third behind Red Bull's Max Verstappen. Hamilton said his lap was "one of the best I can remember". It came out of the blue - Hamilton was 1.3secs faster than his own previous best lap of the weekend, and the scale of his achievement became clear as his rivals crossed the line. Team-mate Valtteri Bottas was 0.7secs behind, Vettel 0.6secs off and Verstappen, surprisingly pipping the Ferrari, 0.3secs. Sebastian Vettel is third, but nowhere near as happy as the two men in front of him. "Obviously there's a big gap if you look at it," he tells Sky Sports. "It is a surprise but it doesn’t reflect the overall performance of our cars. It wasn’t an ideal session for us, we should’ve done better - we had the ingredients and we didn’t put it together. "Third is not a disaster, so I’m not completely upset but we wanted pole. The way qualifying happened it wasn't going to be good. That’s disappointing for now, but let’s see tomorrow. "It’s very close across all sessions everyone’s been up top (Ricciardo, and Raikkonen as well as Vettel), so we can’t expect miracles tomorrow. Nobody has the pace to lap anyone else, but we’ll see what we have to fight with." How about this for a stat? Lewis Hamilton's pole position is the 200th for an English driver in world championship history. The first? That was from Stirling Moss in 1955 at the British Grand Prix at Aintree. Valtteri Bottas, who is on the second row in fourth tomorrow, says: "Formula 1 is always competitive. It's not ideal obviously, but Lewis did a great lap, I thought my lap was OK at the time, but it turned out it wasn’t quite good enough." "Red Bull seemed surprisingly quick based on their FP3 performance, but its good to have them in the mix, there’s Ferrari, Red Bull and us at the top, so it should be interesting. "Everyone knows it’s going to be difficult to overtake here, all three teams will be close and find it difficult because we’re all going for the same thing." After a little more reflection time, the Singapore pole sitter Lewis Hamilton says: "I've got to tell you, this track is epic. It’s also so difficult. It is the most challenging in the year I think – it's Monaco on steroids... longer with more corners. "Yesterday was looking good for us, we came in today and made some changes and we . Everyone started on hypersofts and we started on softs which is a huge difference in comparison. I was half a second behind everyone and I didn’t think I could find that time anywhere. "Then we went into that last session and it was about pulling all of those little bits from practice together. 99.9% of the time it doesn’t go to plan. I just maximised on every corner and I kept pushing. It's so physical here, I was shaking and my heart was racing, I tried to go further and break half a meter and I gave it absolutely everything I had. I was nervous when I came in at the end because I didn’t know if it was good enough. "Everyone has been working so hard trying to find those extra bits of performance. It’s very special, and it’s amazing for us to be on pole given the circumstances." Bishop Yinkus: "To think that @LewisHamilton was nearly out of Quali during Q1, and now he is giving us the real race. Glad he made Q2, if not we would've been denied this fantastic lap"
More quotes from Max Verstappen, who is alongside pole-sitter Lewis Hamilton on the front row. The Dutchman tells Sky Sports: "Very surprising, I think it was a good lap the car was working really well, even with the problems we had, a few times the car fell into neutral it was cutting out power, but very happy to still be second. Asked whether he can win on Sunday, he replies: "It all depends on the start, if you can take the lead there you can have a good chance. Starting second gives you a better opportunity than starting fifth or sixth." On the 2017 race, when he was involved in a first-lap crash with Sebastian Vettel and Kimi Raikkonen, Verstappen says: "it was just a very unfortunate situation and everyone learns from that." An unhappy, and rather despondent-looking, Sebastian Vettel says: "Tomorrow raises a different story, but for sure I'm not happy with today. Qualifying wasn’t as smooth as it should’ve been, other people did better than us." More from Christian Horner: When asked if the cars with Renault engines feel like "an old banger" to drive, he says: "I wouldn’t describe it as an old banger, but you can see they have a few issues. if you just watch it in the pit lane it’s not running clean. "We’ve got a competitive race car, but it’s just not running clean." Christian Horner, Red Bull's team boss says they're not out of the woods with their performance yet, despite Max Verstappen starting on the front row: "Especially after the earlier session today, the balance wasn’t quite right and we’ve got some issues in terms of balance and drive-ability, and we had some issues with chassis, which we sorted out. "I think we could have had a crack on the pole with Max there, it was an incredible lap. Daniel didn’t seem happy in Q3 with the balance as he did in Q2." Daniel Ricciardo was the quickest out there in the first practice session yesterday and quickest in the opening session of qualifying today, but he has to settle for a starting spot of sixth. "We had a little bit of an issue but that's not the reason why we dropped off so much pace," he tells Sky Sports. "We were there, made changes after P3 and after Q1 it felt like we were there and could run with it, but we just stayed as a stalemate and I don't really know why. "Right now I'm struggling to let qualifying go. Even with good pace it is so tricky to overtake, all we can hope for is the cars in front their tyres fall off and have to do two stops. I feel like you don't always get answers with race cars and today is one of those days. "It fell away in the space of an hour and we don't know why. I'm a little bit emotional, I want to figure out and understand why we lost out so much." Kimi Raikkonen tells Sky Sports: "We finished fifth. It was more tricky than what we expected but it is always different in each session, things change quickly and you can’t expect it. "It wasn’t too bad, but it was more difficult to make the tyres work how we wanted in qualifying than any other point this weekend. "Obviously everyone seems pretty close to each other so it will be a hectic race and a lot of things seem to happen here so it will be a busy race tomorrow." Sergio Perez starts P7 tomorrow and he tells Sky Sports: "We were not expecting that. It was a great lap and it just came together. To get a perfect lap here is not an easy job because there's so much stress on the tyres. "The last few races we've done well with both cars. A lot of things can happen here so I'll be very pleased if we can deliver tomorrow. "It's going to be a long day - the performance today was very good and very special." When asked are Force India "redefining what's possible" he says: "We're not thinking that, we're still the same team, but there's still a long time to go." Russell Poulter: Hamilton showing once again he’s the class of the field. Irrespective of what you might think of him on a personal level he’s proving himself to be one of the true greats of the sport. That lap was Senna-esque. Bishnu: Forget it Vettel, you are no match for Hamilton even on a faster car. Try finishing second tomorrow, if you can. After Alonoso, I regard Hamilton is the best driver of the current generation.